May 23 — The federal government increasingly has pushed to investigate individuals who may be culpable in health-care fraud cases after Deputy Attorney General Sally Quillian Yates eight months ago issued a memo saying the DOJ would more closely scrutinize company executives in corporate investigations. 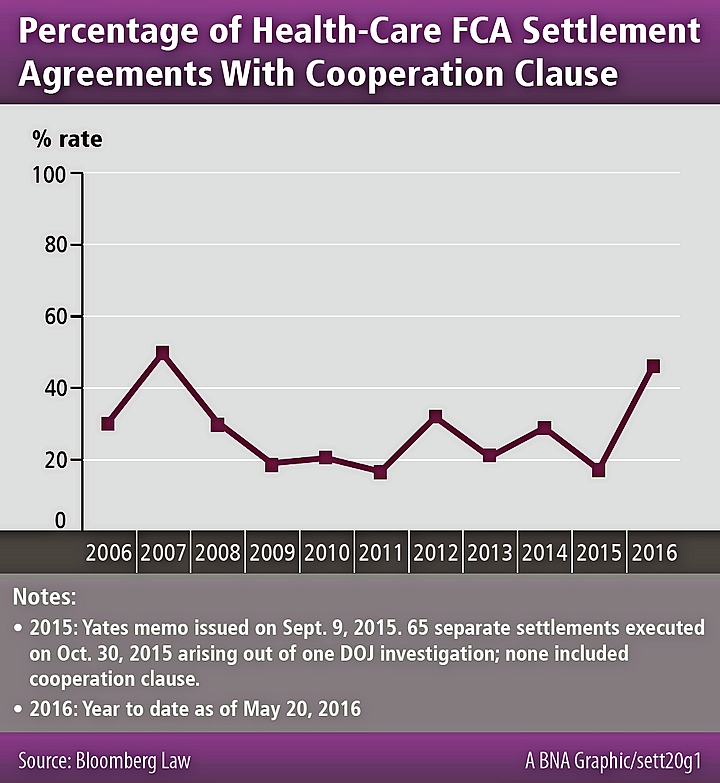 This represents a significant increase from prior years, in which the clause appeared in 17 percent to 32 percent of health-care related FCA settlements since 2008. The DOJ wouldn't confirm whether an increase in the inclusion of corporate cooperation clauses in health-care FCA settlements was one of the changes it made in response to the Yates memo guidance. The FCA is one of the top fraud enforcement tools the federal government has to fight health-care fraud, and the DOJ each year touts the billions of dollars it recovers through FCA settlements, including $1.9 billion in 2015. But, the Yates memo made clear that money damages alone aren't sufficient in combatting fraud. One direct change was the revision of the Filip Factors in the United States Attorneys' Manual (USAM) §9–28.000, with renewed emphasis in directing DOJ prosecutors to focus on investigating individuals who may be culpable in alleged fraud at the start of a corporate fraud investigation. Additional emphasis was placed on full corporate cooperation with fraud investigations, including investigating whether individuals within the corporation itself are liable, as a threshold for the corporation receiving cooperation credit in a settlement resolution. That component-level focus may have also filtered into FCA settlement agreements involving alleged health-care fraud, which in 2016 have seen a significant spike cooperation clauses. produce nonprivileged documents to the government concerning the conduct covered in the settlement. For example, this type of cooperation clause appears in paragraph 14 of the recent DOJ settlement with Pfizer for $785 million on April 27 on allegations that Pfizer subsidiary Wyeth failed to report to Medicaid certain drug rebates that were given to hospitals (82 HCDR, 4/28/16). Cooperation clauses aren't new to FCA settlements, Laurence Freedman, a former DOJ prosecutor, now with Mintz, Levin, Cohn, Ferris, Glovsky and Popeo PC in Washington, told Bloomberg BNA. But, in the past they were the exception, and inserted only when the DOJ expected to investigate individuals who may have been involved in the fraud. But the Yates memo guidance might have changed that, Freedman said. “I do think that [the cooperation clause] will be much more commonly if not routinely demanded by DOJ now that under the Yates memo the presumption is that individuals will not be released and that investigations of individuals are encouraged,” Freedman said. In practice, the DOJ needs the assistance of companies' legal counsel to assist in these investigations, Ogrosky said. For example, executing search warrants on a large corporation can easily turn into “a disaster for the government” because of the volume of documents that results. It's perhaps with that experience in mind that the DOJ has included the cooperation provision with increased frequency in FCA settlements since the Yates memo was released, requiring companies settling health-care false claims allegations to assist the DOJ by conducting investigations into their own organizations and relaying the facts back to the DOJ, with cooperation credit being the incentive to fully cooperate. Yates noted that the DOJ wasn't looking for corporations “to serve up someone to take the fall,” or “boil the ocean” with an overly broad and costly internal investigation. Ogrosky said the expectation that corporations cooperate with DOJ to investigate individuals means outside counsel for companies walk a fine line conducting internal investigations that could uncover incriminating facts that point to wrongdoing by the individual who hired them, Ogrosky said. That means an attorney hired by a company would be bound to recommend that details and documents about potential misconduct be turned over to the DOJ. Ogrosky said he will be looking at whether the DOJ demands that individuals pay settlements as part of big qui tam cases in the future. “It's not so much whether [the DOJ] can extract money from somebody. It's whether they have the resources and ability to pursue a case against these individuals,” Ogrosky said. A potential preview of that test will be in the trial of W. Carl Reichel, former president of pharmaceutical company Warner Chilcott (now a subsidiary of Allergan), which began May 23 ( United States v. Reichel, D. Mass., No. 15-cr-10324, indictment 10/28/15 ). Reichel is charged with conspiracy to violate the anti-kickback law after Warner Chilcott pleaded guilty to health-care fraud for illegal drug promotional activities, and paid $125 million to the government (210 HCDR 210, 10/30/15). While Reichel's prosecution is a criminal matter, Yates made clear that DOJ civil attorneys will be pursuing civil suits against individuals who are implicated in fraudulent activities. That means a corporation may decide to indemnify an executive found culpable in corporate fraud to compensate that individual for the civil judgment amount paid to the government, in which case the deterrent effect of the Yates memo guidance is blunted. Ogrosky said it was an open question as to whether the Yates memo guidance will change whether the DOJ looks at exactly where the money to pay civil monetary judgments levied against individuals comes from. The DOJ “could say, in terms of civil liability, we demand that the individual pay the sum, and we’re not going to accept payment if it comes from the company,” Ogrosky said. Ogrosky suggested that one way to effect a policy change on demanding individuals pay civil judgments from their own assets is to insert a clause in the individual's civil settlement release that demands the money come from the individual. Ogrosky said the DOJ could further specify that the individual settlement amount due would be increased by any amount of money that the individual later received from their employer or other specific companies. A full-text searchable collection of over 600 health-care fraud settlement agreements is available on Bloomberg Law’s Health Practice Center and Bloomberg BNA’s Health Law Resource Center.